We often talk about hunger in statistics to help convey the gravity of the problem. Those numbers are necessary. But the danger of speaking in numbers is losing the humanity of those struggling, both around the world and here in America, with food insecurity. Today, we are sharing powerful images from an exhibit currently on display at the Brooklyn Historical Society, in partnership with Food Bank for New York. As you scroll through this digital exhibit, keep in mind that 47 million Americans struggle with food insecurity. “Children, the working poor and the elderly on fixed income are the most severely affected by hunger. These are the faces highlighted in this exhibit in order to combat the myths about hunger,” says O’Laughlin. You can help combat domestic hunger by donating to our giving partner, Feeding America (a supporter of Food Bank for NY), and hosting a FEED Supper this fall. Maria Rodriguez’s apartment sparkles; it’s a warm and peaceful home. Food from a nearby pantry helps Maria, a stroke survivor, care for her three school-age relatives while their parents work in the Dominican Republic. The children, Ysasbella, Yocet, and Diana, set the table every night. Grandmothers are the familiar faces on the pantry lines. Nora Balfour is 74 and a great-grandmother, but she still calls her husband “Lover” when he calls her after church. He’s in Jamaica, while she’s in the Bronx with her son, his wife, and their children, helping them keep the family together. Nora’s son is a security guard and his wife is a home health aid, both low-wage jobs with hours that vary wildly. Each month, more than a thousand people collect groceries at this pantry, and the number keeps rising. 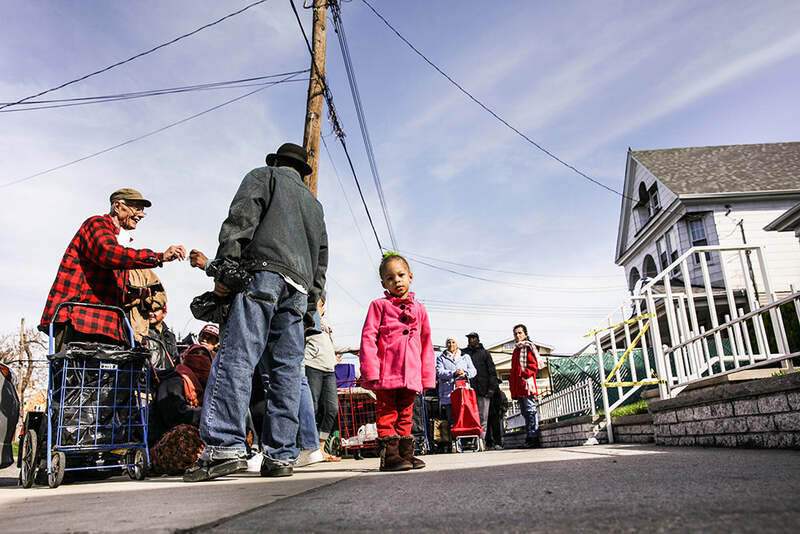 The food distribution is a community service provided by Honor House, temporary housing for veterans in transition. Homes in this middle-class neighborhood sell in the $400,000 range. It was a long day for Gregory and Shamar, 12 and 14 years old. Along with their uncle Otto Starzman, the boys helped set up and break down two food pantries in two different boroughs since their alarm went off at 4:30 am. 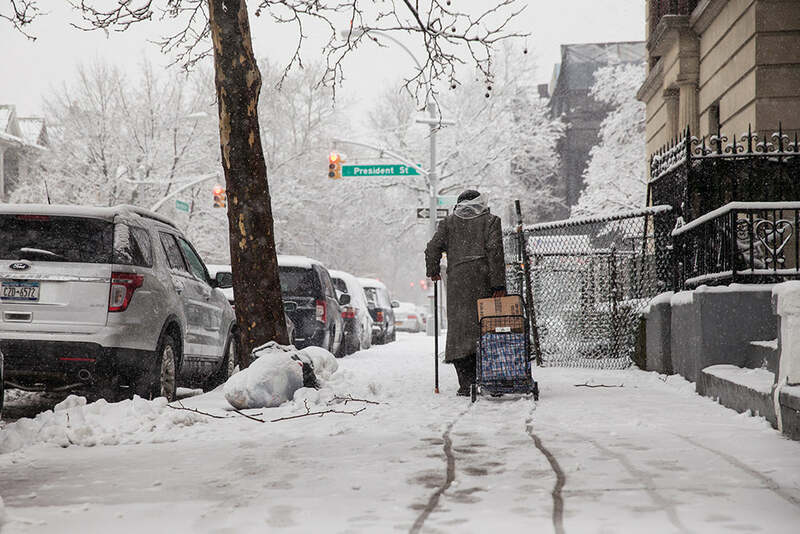 Each week, a typical pantry will distribute thousands of pounds of food to New Yorkers in need. Much of the heavy lifting is done by volunteers, many of whom depend on the pantries to feed their own families. Patrick is 46 years old and disabled by AIDS. He was outed in the military, less than honorably discharged, and never completely regained his footing. 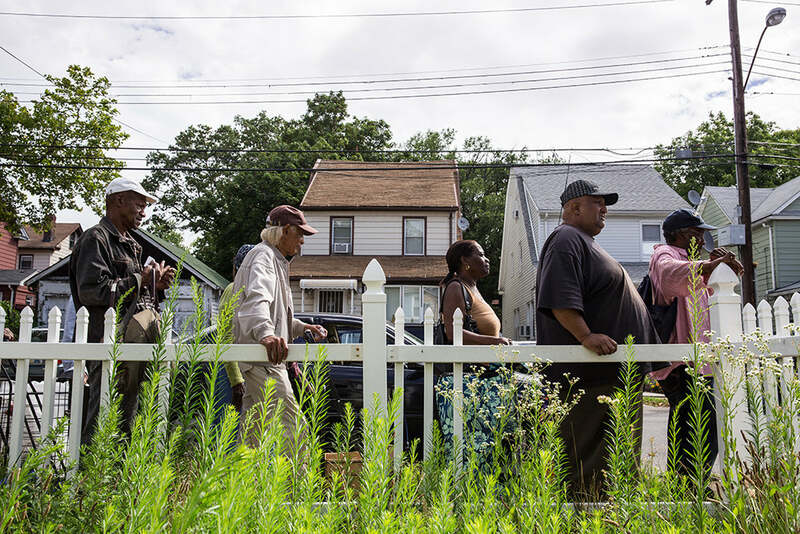 He worked for Housing Works for years and lives alone in subsidized housing in Staten Island, a mile form where Eric Garner was killed. Patrick depends on food pantries to get by and can offer a remarkable accounting for his living expenses, balanced down to the penny. 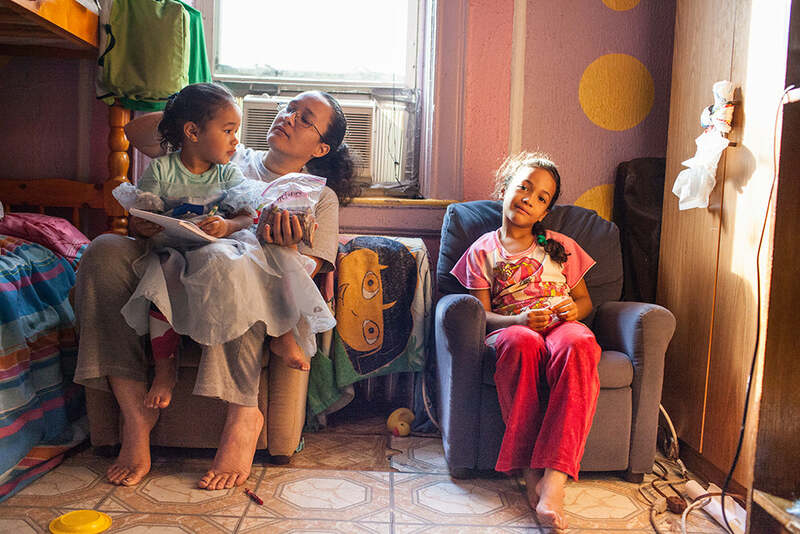 Dina Garcia is a 42-year-old mother of two little girls and a 26-year-old son with three children of his own. She’s resourceful and navigates a challenging life with upbeat resignation. She lives in the Bronx and works in a grocery store bakery on the Upper West Side. Meanwhile, she girls go to a charter school near her mother’s apartment on the Lower East Side. 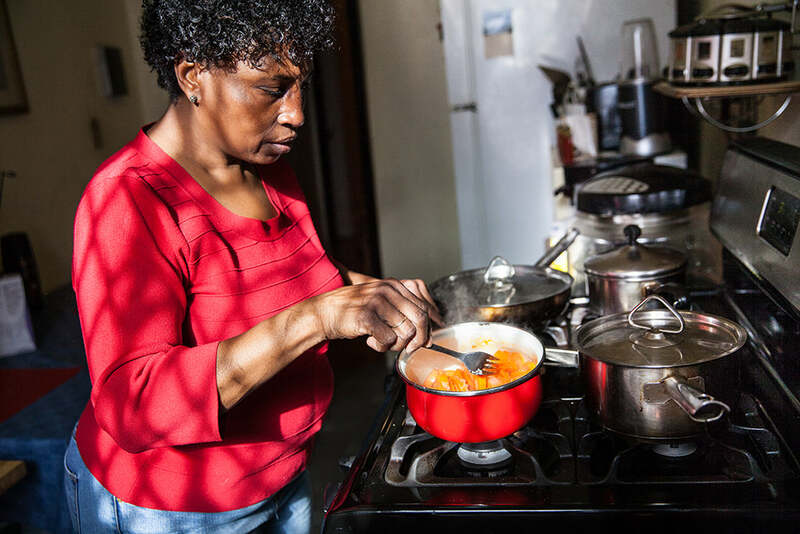 Dina, a life-long minimum-wage earner, visits pantries for groceries and sometimes goes to a soup kitchen that offers family dinners. Mae Tate is a hard-working seamstress in her sixties who was downsized several years ago. Now she works out of her apartment, day and night, seven days a week, but doesn’t earn enough to make ends meet. The cost of living in Bed-Stuy is now so high that Mae can’t afford to shop in the local supermarkets. The pantry bag helps. 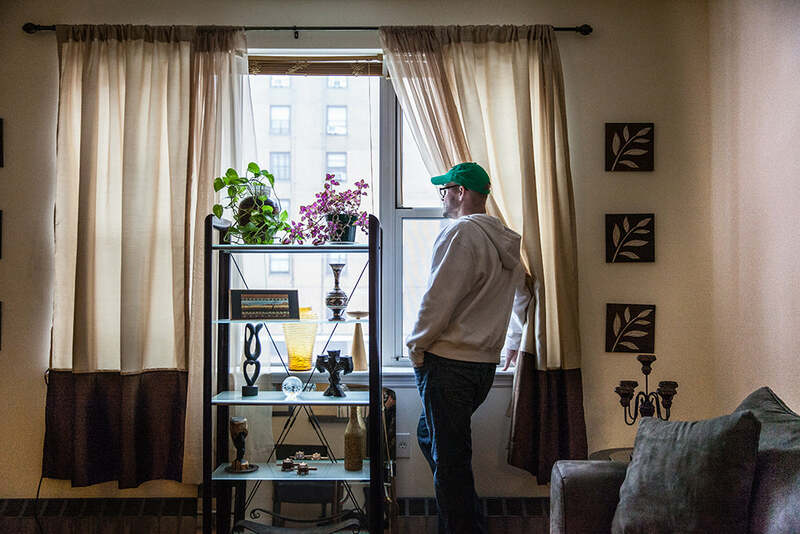 A one-bedroom apartment in this neighborhood now rents for about $2,000 per month. Families line up here every Friday for bread for Sabbath dinner. 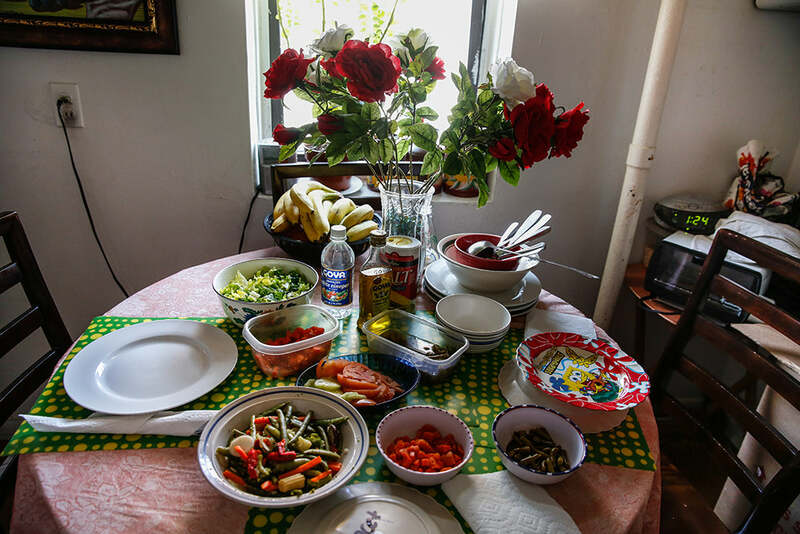 Keeping kosher is hard for families who live in poverty. The food tends to be more expensive and the number of kosher pantries is limited. 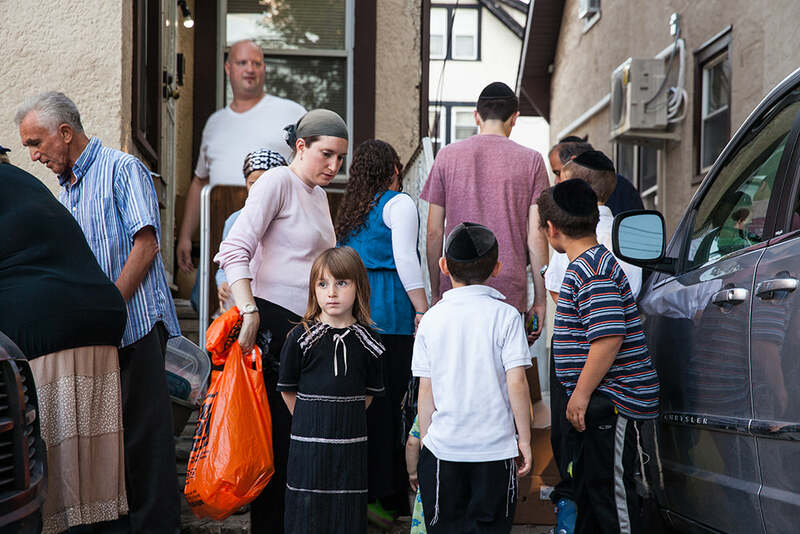 The majority of poor Jewish families in New York City live in Brooklyn. Emily Diac, 5 years old, waited while her mother shopped at a food pantry. Her family has relocated to Marietta, Georgia, where her mother, Mina Reyes, works at Sam’s Club and her father is a maintenance man. Life here was unaffordable. 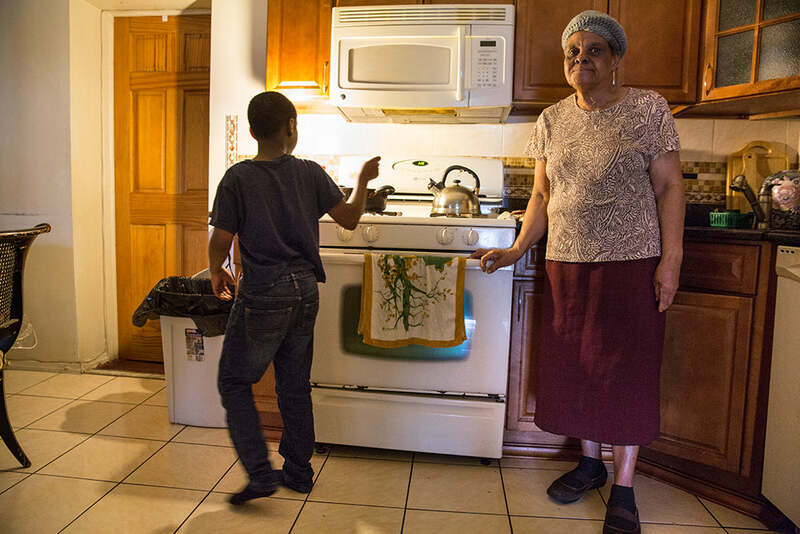 One in four New York City children doesn’t have enough to eat. Ms. Reyes didn’t want Emily or her bothers to be part of that statistic, so they were forced to leave the city. Hunger is a constant, and it disproportionately affects the most vulnerable among us, especially children and seniors. Pantry lines form before the sun rises; people are anxious to get he best offerings—fresh food priced out of reach in supermarkets. Sometimes the wait is three hours—a tedious, but dependable option for feeding a family.